Do I have the strength to dust myself down and go at it for another year, with diminishing returns, or shall I just pack it all in? I ask myself this question every summer. But enough about this blog, because the season’s started, and it started with a bang, a crash, several more bangs and a cavalcade of comedy defending. Wotcha Arsenal! If you were the kind of person who’s prone to pass judgement on our chances after a game, you’d suspect that having drunk another potion of neat Arsenal from the cup of pure Arsenal, we’ll spend the season hallucinating undistilled Arsenalness all the way through till April. Then we’ll come round, wondering why we’re 6th, and stagger off on a run of solid form before resting once again for the summer. But honestly, it’s a wee bit too early for that. We had just one real central defender available (there are a further four, if you include the unloved Calum Chambers, waiting in the wings) and we duly defended as if we’d erased defending from our minds over the summer months. I forget my work password after a week off – so I can understand how easy it might be for the concept of marking set pieces to disappear in a puff of smoke after eight weeks on sunloungers. Maybe they should just write it down? It was a day to remember for Lacazette, who showed a real instinct for goal and looks like he’ll fit in well. Eat that Dennis Bergkamp, with your seven fallow games with no goals! (No, I’m not sure where I’m going with this either). Aside from that, it was a reminder from two oft-derided players of their value. Ramsey got us level with a lovely finish, and Giroud powered a honker of a header over the line for the winner. Yes, he’s a bit slow, and no, he doesn’t always fit in when you want to play at pace and on the break, but how the hell do you replace a contribution like that? Who else scores those kinds of goals for us? It would be nuts to jettison Giroud, frankly, and I hope when Wenger says Giroud’s happy and wants to stay that that’s the end of it. Because in Giroud, Walcott, Welbeck, Lacazette and Alexis* there are a lot of goals and there’s a lot of variety. There’s room for a break and there’s room to chop and change. So although we promised to screw things up on day one, we kept ourselves intact for some stern incoming tests. Job done. August is a strange month, because when the season begins there’s still three weeks of transfers to go. I know we all like to have everything nailed down and ready to go, but that’s never going to happen. The way things are, with the amount of money still left unspent and some big transfers brewing in Europe that could foment things further, I’d be amazed if our squad doesn’t change some more by 1st September. In the meantime, we just need to battle through the jittery early stages. And learn to defend a bit – that would be nice. It’s good to be back. Good summer, everyone? 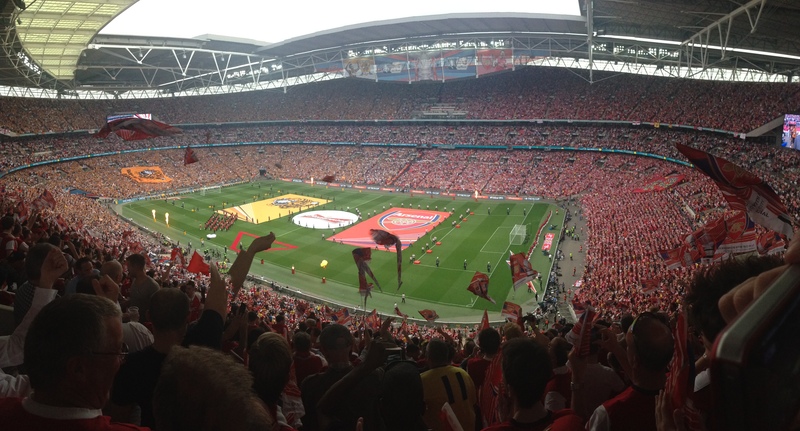 What a day, what a performance, and if anyone over the last few years has ever said to you: ‘Think how good Arsenal could be if they played to their full potential’, simply point them to Wembley Stadium, 27th May 2017. No shrinking in the face of the big challenge here. In the white heat of a cup final against the champions, a match few expected us to win (not least me), we pulled our best performance of the entire season out of Arsene Wenger’s moth-eaten magic hat. He clearly said, “I’m having that”, and have that he did. Our motley back line held firm for all but one moment. Our midfield was in control and high-energy, and going forward our pace caused considerable problems. I’m not going to run through the whole team, because to a man they were magnificent, from the evergreen Mertesacker (an inspiration on and off the pitch) through to the fizzing dynamism of Ramsey and beyond to the irrepressible Alexis. What got me out of my seat was the way we broke with such menace. For too long (and too often) we’ve watched as Arsenal ping it upfield then get bogged down. But on Saturday, with extraordinary regularity, we went for the jugular with our directness and pace. It was genuinely exciting football, and a reminder of the sheer excitement it can bring when all the elements come together. It hasn’t been like that enough this season. But – ah yes – that’s how it can be. It was a final that just had it all, to be honest. A hot May day, two big teams contesting it, a bit of controversy right at the beginning, a hatful of chances and a winning goal only several minutes after the equaliser. An embattled manager proving a point against a manager whose stock couldn’t be higher. And then there was the build-up, with that special tingly pre-cup-final atmosphere that is palpable but hard to explain. Nerves, excitement, anxiety. Fans and friends from far and wide. It baffles me that some seem so willing to denigrate the FA Cup – the most important domestic cup competition – while simultaneously complaining about clubs celebrating getting into the top four as if it was a trophy. Let me clear this up. 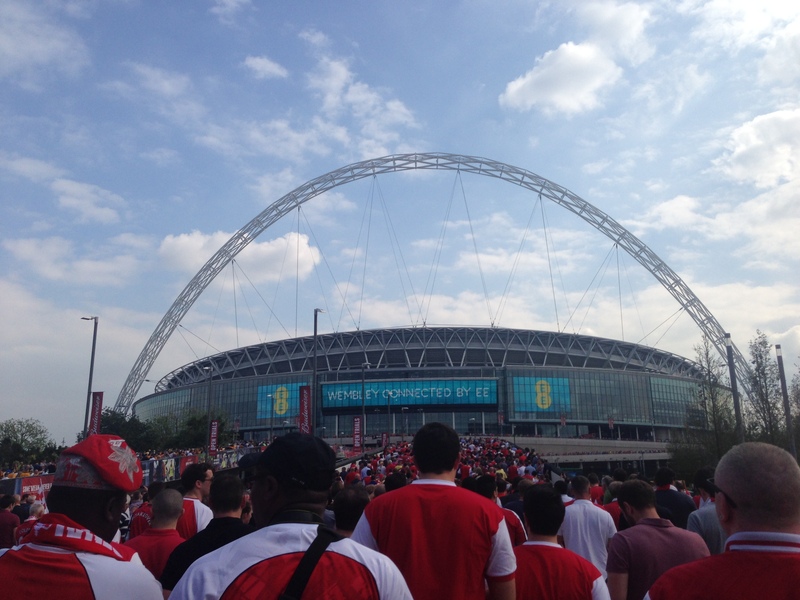 The FA Cup is a trophy; getting into the Champions League is not. I would rather have an FA Cup win over getting a place in the Champions League any day of the week, frankly, and not just because we’re very good at one and very bad at the other. Anyone who was at Wembley, and all those watching in pubs or at home with friends – feeling the highs and the lows, the swings and the roundabouts, the tantalising prospect of elation and of real success – will surely agree. And finally to Wenger, the seven-times-FA-Cup-winning elephant in the room. All but the most curmudgeonly will grant Wenger the respect and gratitude he deserves for an unparalleled achievement. The team rose to the occasion and showed us what it can do. He got it right. I’m well aware this muddies the water for some, myself included. But I suspect it has calcified the thinking of the man who pulls the strings, Stan Kroenke, and for all the recent obfuscation and whiff of power struggle, for all the deflection and uncertainty, I’d still be surprised if Wenger wasn’t here next season. Well played Arsenal. You have made me happy. I say this of course because we’ve all known for some time that November brings sterner autumnal tests gusting in from the north and west. The last thing we needed ahead of that kind of storm front was to get our chimney knocked off by gentler breezes in the south. As it happens, managerless Palace were far from a breeze and it took a performance of some determination from us to take the points. It wasn’t pretty and we weren’t at our best, which is why the man of the match award went not to one of our midfield creators but to Wojciech ‘The Woj’ Szczesny for a superb double save just at the point where, at 1-0 up, we were wobbling. He was excellent – as were, in the second half in particular, Sagna and Ramsey. Perhaps I ought to add Giroud to that list, who ran himself into the ground. He looked utterly destroyed at the end of the game, which is both heartening and faintly terrifying in equal measures. As for Arteta, it was perhaps foolish to get that close to Chamakh but a red for that? He was on the right-hand side of the pitch and 45 yards from goal. Defenders were not a million miles away. Very harsh. In midweek we have a date with Chelsea in the Rumbelows, and it’s very hard to know what approach to take in that, especially with Liverpool looming on the weekend. In the absence of our legion of crocks (Walcott’s three weeks out has turned into another infamously un-three-week absence), some of our players need a breather. Ozil looks like he does, Giroud too, Wilshere is not 100%, Flamini and Arteta are both out. Podolski and Oxlade-Chamberlain are still nowhere to be seen. I will rotate against Chelsea, yes, but play with a team as well who has a good chance to qualify, that will be the target. So basically, your guess is as good as mine. I don’t wish to get all meta about things, but do you ever wonder why you like football? The comfort of routine, the camaraderie, the sense of belonging, the escapism, the commitment and the competition? Well, yes, it’s all of those things. But sometimes the pleasure you take in football can be summed up in one pint-sized package of play, lasting perhaps no more than ten seconds. It doesn’t have to be a moment of real consequence, such as the one that ended with Thomas squirming in the turf in 1989 or Adams barrelling through to score from a Bould assist in 1998. It can just as easily be a split second of pure skill and nerve, like Bergkamp spinning on a sixpence to score at Newcastle in 2002. We all remember those moments, the ones that take your breath away and make strange parts of you tingle whenever you think of them. Because they are so out of the ordinary, so rare in the grand scheme of things, they give you a warm fug that’s sometimes hard to explain and – I suspect you know where I’m going with this – I got it when I saw Wilshere’s goal yesterday. And when I thought of it just now. And when I think about it tomorrow, it’ll happen then too. It was just so preposterously good. To pull a move like that off, one between that many players, requires confidence, skill, but above all luck – those touches are so deft, the smallest error or the most infinite of hesitations would have brought the move to a crashing halt. Everything worked, from everyone. Gibbs, Cazorla, a flurry of outrageous touches between Giroud and Wilshere then a one-touch finish. That’s football, for me. That’s why I love it. It was worth the £35 on its own. Other moments of great skill yesterday will justly feel left out of my paean. Ramsey’s this-way-and-that jink and finish, his cutback for the fourth, Giroud’s laser-guided cross onto the Ozil bonce for the second – all magnificent. Just not quite as magnificent as that first. Soak it all up, because this is good stuff. The irony has not been lost on me that in a season where Arsenal have made the best start in ages, and are playing their best football in ages, my own attendance is showing relegation form. I’ve been away, or otherwise engaged, for four of the six home games this season – very much a case of #eastlowerout. I intend to start putting this lamentable form right, beginning on Tuesday against Dortmund. In the meantime, I might just watch those goals again. A while back – and for a long period, to be fair – this whole blogging lark was often less fun than it ought to have been because Arsenal kept repeating the same mistakes. There was practically a template you could dust down for a certain kind of Arsenal result. You know, letting the first goal in, fannying around too much, leaving things late, general sluggishness. It’d happen once, then there’d be a gap, then it’d happen again. Back and forth it went. Everyone got a bit cross. They’d get happy for a bit and then they’d get cross again. *There really is no need to answer this. Seriously though, there’s nothing better than riding the wave, is there? That even without a cavalcade of unavailable players, we’ve still got enough in the tank to up our game when needed and grind out a win. When things are going badly, you can wheel out a rookie like Gnabry and he’ll look, you know, like a rookie. But when things are going well, there’s enough confidence about the place for it to work. And what goals they were, on Saturday. If I had to describe Ramsey’s for a radio audience, I’d probably go for something like tackle-ping-ping-ping-ping-pause-BOOM. This might explain why I don’t work in radio. And as for Mr Now – so utterly pivotal at the moment – I love his disguised pass that Gnabry scored from. You can only do that when you’re at the top of your game and I must have watched it 10 times already. Onto Napoli, a game I can’t make. Nor indeed can my brother, and he put both our tickets on the exchange on Saturday. The place was like a bag of piranhas – they went in moments. Practically snapped out his hands. This is what a winning run does. And a big signing, of course. Wenger’s fears about us having to use the same players twice a week thanks to our injury epidemic are fair enough. We may come unstuck because of it (all good things come to an end of course). But he couldn’t have asked for much more of them so far. I find myself in a calm place. Enjoying the run we’re on, enjoying watching the team, but massively cautious about the season ahead. It really is, to coin one of football’s oddest sayings, still early doors. Well that went well. we rode the storm a bit but hit the sweet spot with Walcott’s strike and never looked back from there. This is a devil of a group – the best one we’ve had in a while (I mean that – it’s much more interesting this way) so to hit the ground running with an away win is just what the doctor ordered. Keep the prescriptions coming, Dr Win. It has to be said, the hand-wringing and wailing over our summer of glacial transfer action and the opening day defeat to Villa have obscured – at least they have to me, for I do like to wail and wring my hands – what a good run of form we have hit since winning in Munich back in March. Ten away wins in a row is phenomenal, to be honest, as is one defeat in 18. Sorry to put a dampener on things, but there will be setbacks. However, the trick when that happens is to get back in the saddle like we did after losing at home on the opening day (I never was good at metaphors). It sounds easy but as we know, it is never quite that simple. There have definitely been times over the last few years that playing at home has hindered us, little bit handbraked us, left us wallowing too much in the wanting zone, but I do think that sloshing £42.5m on a proven, top class player has Ozilified the home crowd somewhat. Let’s hope so because the players can feed off us, we can feed off the players: job’s a goodun. One more thing: In an era of angst about the dearth of talent of the home nations, it was heartening once again to see Gibbs and Ramsey having such good games, for Walcott to score the crucial opening goal and to see Wilshere edge back to fitness. If England do drag themselves over the line to Brazil, it’d be a shame if all three of those Englishmen didn’t make it on the plane, but for Gibbs to get there it might take an injury to Cole or Baines. It is his misfortune to play in one of the positions where England are genuinely strong. Still, he’s improving fast and it’s lovely to see. Now, if you don’t mind I’ve got to make some finishing touches to my Giroud Knee Shrine. There will be humming and probably beads.